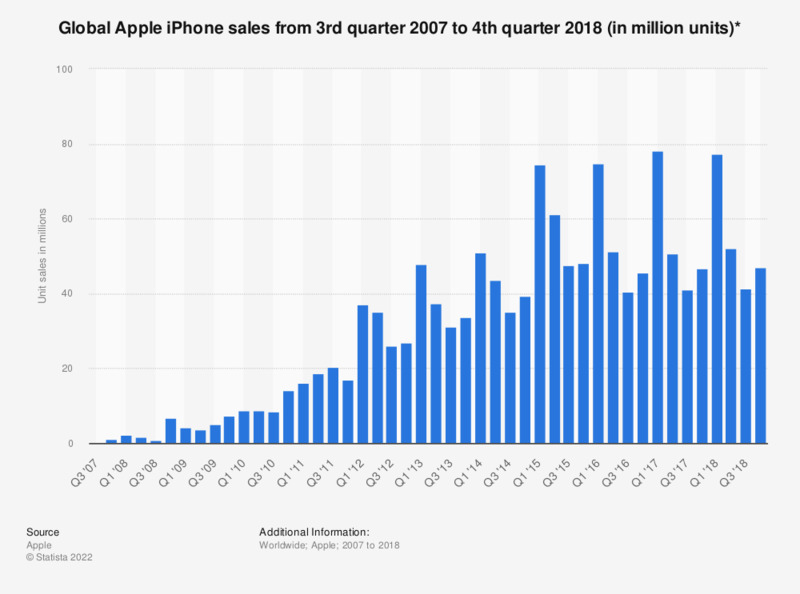 This statistic shows Apple iPhone sales worldwide from the third quarter of 2007 to the company's most recent financial quarter. In the forth quarter of 2018, 46.89 million iPhones were sold worldwide. In the 2017 fiscal year, Apple sold 216.76 million iPhones. The first generation of Apple’s iPhone was introduced in 2007, bringing innovative features such as a touch screen interface and a virtual keyboard to a broader audience. Considered by many as a revolutionary product, the Apple iPhone drove growth for the smartphone market. Since its introduction to the consumer market, Apple has released eleven generations of the product, along with new features and updates. The iPhone runs on Apple’s own mobile operating system iOS, the second most popular smartphone operating system in the market. In 2017, the iPhone made Apple the second-largest smartphone vendor in the world, with a global market share of almost 15% percent. The iPhone has changed Apple’s business dramatically. iPhone sales have risen strongly over the years, from around 1.4 million iPhones sold in 2007 to more than 216 million units worldwide in 2017. In total, Apple has sold more than one billion iPhones worldwide from 2007 to 2017. In the first quarter of 2018, iPhone sales accounted for about 70 percent of Apple’s total revenue, generating more than 61 billion U.S. dollars in revenues. Partly thanks to the iPhone’s success, Apple ranks amongst the most valuable brands in the world. The technology company has achieved this position by combining technical innovation and minimalistic design. Apple’s success translates into strong brand loyalty, as well as into its revenue growth. In ten years, Apple’s revenue increased from 8 billion U.S. dollars in 2004 to more than 229 billion in 2017. The quarterly periods for Apple's fiscal year include the following: early October to late December of the previous year (first quarter), early January to late March of the stated year (second quarter), early April to late June of the stated year (third quarter) and early July to late September of the stated year (fourth quarter). The Apple iPhone was first sold in June 2007.